Since its success in acquiring Langhorne Heritage Farm, LOSI has hosted a variety of events and programs at this site. Our organization is committed to ensuring that to the extent possible, preserved land is available for the enjoyment of the members of the community who made that preservation possible. Every summer, Langhorne Heritage Farm hosts community gardeners from throughout the area. The Community Gardens started out in 1986 with eight plots. Today, 100 plots are rented out for flower and vegetable gardening. 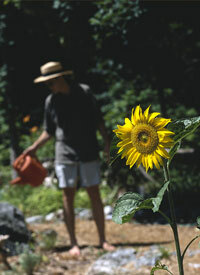 The community gardens are 100% organic, as the use of herbicides, pesticides and chemical fertilizers are prohibited. Included with the plot fee is a thorough rototilling and chiseling of the soil, performed in the spring just prior to opening day. Also, for the convenience of the gardeners, nine water taps are located throughout the field. Our gardeners take care to water wisely and conserve this most precious resource. Click here for more information and to apply for a Community Gardens plot. LOSI is proud to host a local artist community at Heritage Farm, Nearly a dozen artists rent studio space at the Farm during the warm weather months (April through October). The studios are located in the various ‘outbuildings’ at the Farm, and are available for single or group usage. Located in former chicken coops, the calving barn, and utility buildings, the studios have been cleaned out, painted, and decorated by the resident artists. Here, they paint, design murals, make jewelry, and pursue photography. 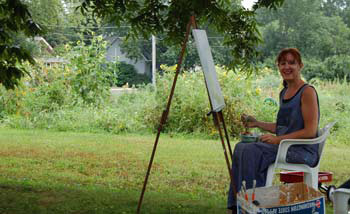 For several years, the Artists-at-the-Farm have been featured in the fall ARTFEST held at the Farm. Attended by hundreds of visitors, the ARTFEST showcases the work of our resident artists, sponsors a children’s art show, hosts a poetry slam, and features a variety of music and dance performers. For more information about the Artists-at-the-Farm program, contact Carol Zetterberg (215-757-4721; Carolzette@aol.com). Langhorne Open Space hosts free concerts at the Farm each year. 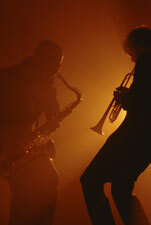 Each spring, we host an open-air concert called Jazz-at-the-Farm. This event showcases talented local student jazz bands from Neshaminy High School. The event often features a professional guest soloist. Hundreds of local residents trek to the Farm with folding chairs and blankets to enjoy an afternoon of classic jazz and vocals. This year’s Jazz-at-the-Farm concert will take place at 4:30PM on Saturday, May 11, 2019. For details, contact Jazz-at-the-Farm organizers Patrick and Betsy Carr (215-757-3630; patbetsy@comcast.net). During the summer, we host a series of free Big-Band concerts called Swingin’-at-the-Farm. This event features the Straight Ahead Big Band consisting of 20 professional musicians from throughout the area. 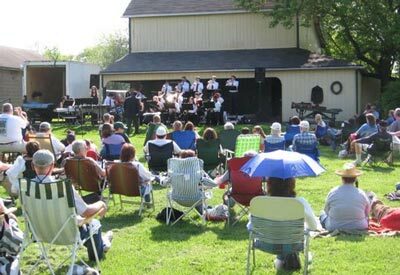 Bring your folding chairs and blankets to enjoy an afternoon of big-band music under the open skies at The Farm. Dates for the next Swingin’-at-the-Farm concert for the 2018 season is Sunday October 14 (1PM) . As concerts are scheduled, we’ll post the dates here on the website, and on banners posted around town and at Heritage Farm. There are currently no “Concert-under-the-Stars” events planned. This concert is free of charge, jointly sponsored by Langhorne Open Space and Langhorne Council for the Arts. Bring your own lawnchair or blanket and enjoy the tunes in front of the Main Barn at Heritage Farm (222 N. Green Street, Langhorne). There’s plenty of free parking on site. In addition to our annual Membership Drive, Langhorne Open Space conducts a number of fundraisers to help support its activities. In the past, these fundraisers have included Haunted Farm (1985-1989), Country Fair (1985—1989), and Antiques Appraisal (1990). Proceeds are used to finance our open space acquisition efforts, and to maintain and beautify Heritage Farm. For the past several years, we have held Flea Markets at the Farm as a fundraiser for Langhorne Open Space. Starting with just 20 vendors the first season, the Flea Market has grown to over 100 vendors. Hundreds of buyers attend this popular event. Flea Markets are held once in the Spring, and again in the Fall. Selling Spaces are available for rentals large enough to park your vehicle right next to your selling area. Vendor set-up starts promptly at 6:30AM. Selling hours are from 8AM – 1PM. The Bovine Cafe (our refreshment concession) is open for every Flea Market. Donations Needed! For those who prefer not to be a ‘vendor’, but want the opportunity to clean out attics and garages, we offer the opportunity to donate saleable items to our “Farm Store”. All proceeds from the sale of these items support the activities of Langhorne Open Space. (Sorry, but we can’t accept clothing, furniture, computer equipment, record albums, or toys. Children’s books are welcome, but other than that we can’t accept any more books right now.) For more information about donating items to the Farm Store, please contact Debbie Miele (215-752-8066). Spaces are limited, so send in your reservation form early. To reserve your space for the upcoming Flea Market (Saturday, June 8, 2019), please fill out the attached form and mail it together with your check to the address indicated on the Attached Form. For general information about the Flea Market and Vendor Spaces please contact Flea Market organizer Bob Duaime (215-752-4289; fleamarketlosi@juno.com). Every year, Langhorne Open Space conducts a Christmas Tree sale on The Farm grounds. The trees are provided by a farm in north-central Pennsylvania known for supplying trees to the White House and the Smithsonian. 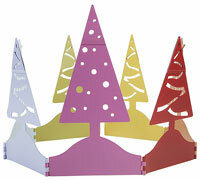 We offer a huge selection of trees ranging from table-top size to 10 feet. Sale dates are usually the Sunday of Thanksgiving weekend, plus the following two weekends. Specific dates/ times will be posted as we get closer to the event. Be sure to come early for the best selection! In addition to the trees, fresh fir wreaths hand-decorated by the Wreathmakers of Heritage Farm are available for sale. For information, contact Christmas Tree organizers Bob & Deb Tyl (215-752-2521) or Beth Delaney (215-757-1435). Langhorne Open Space, Inc. (LOSI) is a 501 (c) (3) non-profit organization dedicated to the preservation of open space in the local area. Langhorne Open Space offers unique gifts at each membership level. Please see the membership application for a list of available thank-you gifts. © 2016 Langhorne Open Space, Inc. | Donated by LeapGo.